Recognition, the core theme of this review, is a fundamental skill crucial for Emergency providers when challenged with serotonin syndrome. Serotonin syndrome is rare but an increasingly more common disease seen in the emergency department with advent of newer pharmacologic agents targeting the central serotonergic pathways, both intentionally and inadvertently. This condition is not forthright and can be rather elusive, more of a spectrum of severity; ranging from mild anxiety and tremor to agitated delirium and myoclonus. The key for the EM provider is early recognition when symptoms are mild and to avoid iatrogenic progression (Primum non nocere). Mild symptoms are often overlooked, and inadvertent increase in the dose of the causative agent or the addition of a drug with pro serotonergic effects may promote a dramatic clinical deterioration. Central nervous system serotonin excess as a clinical problem in humans was first noted by Oates and Sjostrand in the 1950’s. The reported patients who developed symptoms after receiving tryptophan while on therapy with a monoamine oxidase inhibitor. Symptoms manifest predictably, with increasing intrasynaptic serotonin concentration i.e. the more serotonin stimulating the post synaptic receptors, the greater the symptoms. Occasionally, monotherapy may precipitate symptoms, but most severe reactions are attributed to polypharmacy. 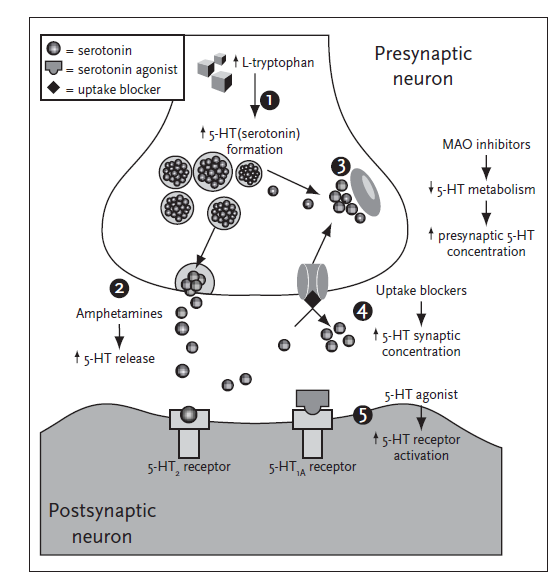 Serotonin is dose dependent and typically occurs within 24 hours of ingestion, often with initiation of a new serotonergic medication co prescribed with a second agent. This may be seen in a patient with depression on an SSRI with acute or chronic pain who then have narcotics added to their regimen. Approximately 60 percent of patients with the serotonin syndrome present within six hours after initial use of medication, an overdose, or a change in dosing (ask about recent medication changes). Oates et al. demonstrated a dose-response relationship between tryptophan and the clinical manifestations. With tryptophan doses of 20 mg/kg, the most striking effect was altered mental status with a state mimicking inebriation. With doses of 30 mg/kg, hyperreflexia and clonus were noted. At doses greater than 50 mg/kg, diaphoresis and myoclonus were also noted (Martin). Intentional misuse, overdosing, or concomitant use of multiple serotonergic drugs in therapeutic dosages may result in serotonin syndrome. Serotonin is an essential neurotransmitter found in the central nervous system at the brainstem raphe nuclei as well as in the periphery within intestinal enterochromaffin cells and platelets. Centrally, it regulates wakefulness, affective behavior, core temperature, vomiting, eating behavior, and sexual behavior. In the periphery, it modulates gastrointestinal motility and vasomotor function. Classically this syndrome is described as a triad: altered mental status, autonomic dysfunction, and neuromuscular abnormalities. However, as noted above, the severity of each triad portion is dependent on the total serotonin present; ranging from barely predictable to lethal. Clinicians and patients may dismiss symptoms such as tremor with diarrhea or hypertension as inconsequential; anxiety and akathisia may be misattributed to the patient’s mental state. The characteristic manifestations of this include: anxiety, agitation, delirium, coma, mydriasis, diaphoresis, hyperthermia, lacrimation, diarrhea, tachycardia, fluctuating blood pressure, mutism, tremor, rigidity, myoclonus, and seizure. The differential diagnosis of the syndrome is extremely broad and includes encephalitis, neuroleptic malignant syndrome (NMS), hyperthyroidism, septicemia, anticholinergic toxicity, cocaine and amphetamines. Historically, NMS has been described when discussing this syndrome due to the “common presentation”. However, with a good history and physical examination, true etiology can be elicited. Serotonin syndrome (serotonin agonist) typically occurs over hours to a day versus days to weeks with NMS (dopamine antagonist) but may occur at any time during therapy. 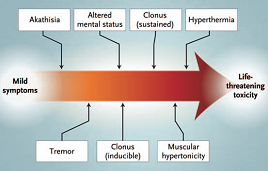 Patients with SS are hyperreflexic often with clonus and tremor as opposed to NMS where you see hyporeflexia and severe muscular rigidity (often described as lead pipe). The first step for management is to minimize progression of symptoms. In the Emergency Department, this means recognition of serotonin syndrome and 1) remove offending agents 2) Do not add additional medication which may worsen condition. Most cases will resolve within 24-36 hours with supportive care. Much of mild to moderate management consists of supportive care; this may include external cooling and sedatives. On the more severe spectrum of disease activity an attentive and active role must be taken. Extreme muscle activity may lead to rhabdomyolysis and acute renal failure; generous IV fluids may be necessary. Neuromuscular and autonomic instability may lead to severe hyperthermia. For patients with temperature >41C, recommendations are for immediate sedation, neuromuscular paralysis (decrease the muscular activity), and orotracheal intubation with mechanical ventilation. Be wary of succinylcholine for paralysis; patients may have muscle break down and hyperkalemia may lead to life threatening dysrhythmia. Physical restraints are ill advised in these patients and may actually contribute to mortality by enforcing isometric muscle contractions; this may lead to further lactic acidosis and hyperthermia. If necessary, this should be transient, and rapidly replaced with a chemical restraint. Benzodiazepines are the core pharmaceutical agent used to diminish muscle hyperactivity and reduce excessive sympathetic outflow. Case reports and animal studies demonstrate some effectiveness with use of serotonergic antagonists; however, conflicting data in human subjects fail to consistently show benefit of administration of agents such as cyproheptadine. Adults often require high doses (12-32 mg) during the first day (this dose will bind up to 95% of serotonin receptors). Martin, Thomas. 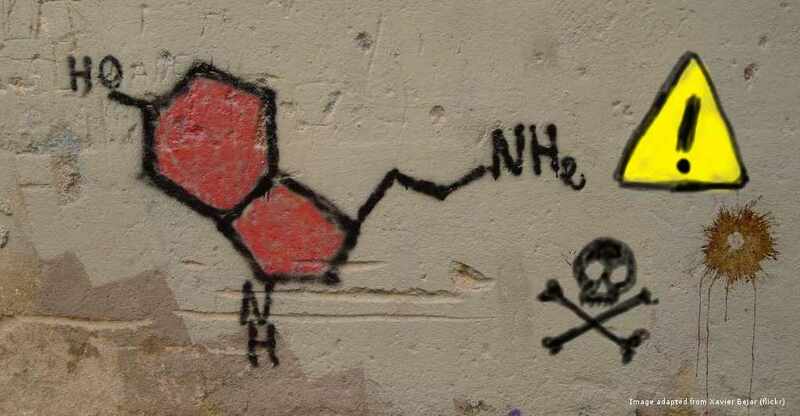 Serotonin Syndrome. Annals of Emergency Medicine. 28.5. Nov 1996 520-526. Dunkley et al. The Hunter Serotonin Toxicity Criteria: simple and accurate diagnostic decision rules for serotonin toxicity. Q J Med 2003; 96:635-642. Boyer, Edward and Shannon, Michael. The Serotonin Syndrome. N ENGL J Med 352;11. March 17, 2005. 1112-1120. Bijl,D. The serotonin syndrome. Netherlands Journal of Medicine, Oct 2004,Vol.62, no.9. Rastogi et al. Case Scenario: Opioid Association with Serotonin Syndrome. Anesthesiology, V 115 No 6, December 2011. 1291-1298. Hick JL, Smith SW, Lynch MT. Metabolic acidosis in restraint-associated cardiac arrest: a case series. Acad Emerg Med 1999;6:239-45.